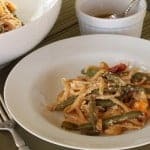 Spicy Vegetable Pasta, it’s the chili oil that takes this easy pasta recipe from ordinary to extraordinary. So easy to make. Heat oil, red pepper flakes, garlic and salt for 3-4 minutes. Done. How much do you spend on groceries versus eating out? In a report from the USDA Economic Research Service, food sales between at-home and away-from-home are even steven. We spend nearly equal amounts on foods purchased at grocery stores and foods purchased at restaurants, concession stands and other away from home eating places. I’m not average. Are you? It’s in my favor (and yours) to not be average. More of my dollars are spent buying food to cook at home. It’s fun to eat out, but when I eat in it’s easier to eat better. For one thing, no one delivers a bread or tortilla chip basket. Plus at home, I’m not tempted by the big-as-my-head portions. I like to be master of my universe by cooking and controlling those portions and calories. A study on meals found that people who eat the most home-cooked ones end up eating healthier food and with about 130 fewer calories daily. That may not sound like many, but add that up over a week or year. That’s how weight creeps up on you. Taste is the number one reason people choose the foods they do. Restaurants survive by knowing how to tempt us with flavor. But home cooks can meet the taste challenge. Certain cooking techniques can exponentially punch up your cooking results. 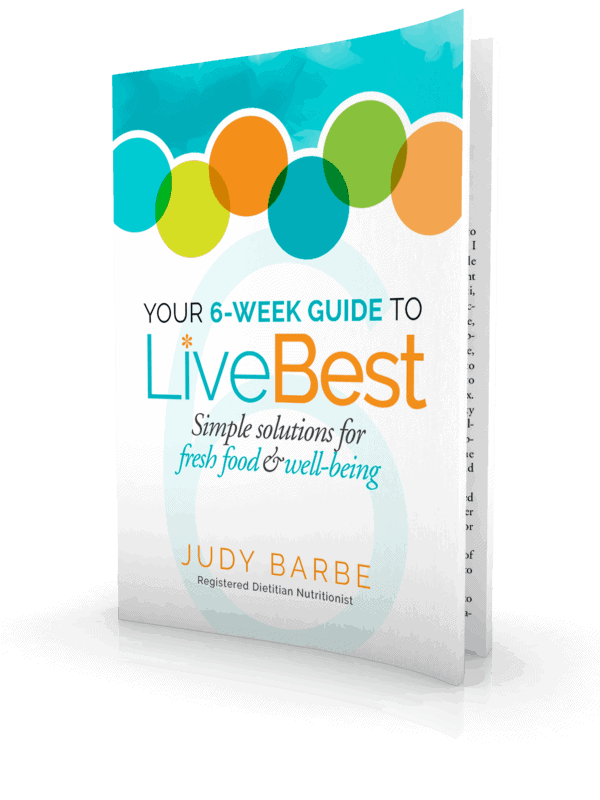 Even more, flavor is an effective and enjoyable way to reduce sodium, sugar, and fat. So your home cooking gets even better for you. Add a pinch of thyme when cooking mushrooms. Sprinkle of red chile flakes to eggs, bean dip, hummus or a roasted red pepper dip. Stuff fresh herbs under chicken skin before roasting. Toss popcorn with smoked paprika or ancho chile to spice up your snack. Or stir a little bit of chile into hot chocolate. Add rosemary to bean dip. Mix curry powder into chicken salad or egg salad. Add fresh herbs to vinaigrettes or make herb dip with yogurt. 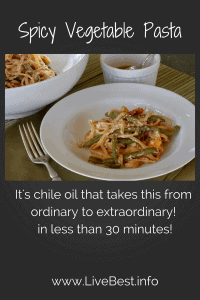 Spicy – The chile oil is what makes this dish. It took the easy pasta recipe from ordinary to extraordinary — making this a definite dinner do-over. And it is so easy to make. Heat oil, red chile flakes, garlic and salt for 3-4 minutes. Done. Vegetable – In this recipe I’ve used green beans and cherry tomatoes. If you like sweet potatoes, squash, broccoli would also be good additions or substitutes. Pasta – I used whole-grain linguini, but farfalle or penne would be just as good. It’s an easy pasta recipe, so use what you have on hand. Check out more recipes and tips to use what you have on hand and reduce food waste. 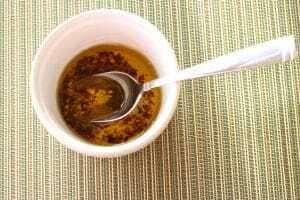 I can think of several things to use this chile oil on (popcorn, dip for bread, vegetables). 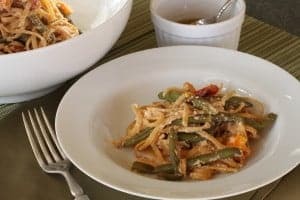 Spicy Vegetable Pasta, it’s the chile oil that takes this pasta from ordinary to extraordinary — making this a definite dinner do-over. And it is so easy to make. Heat oil, red chile flakes, garlic and salt for 3-4 minutes. Done. Cook the pasta according to package directions until firm to the bite. Reserve 1 cup of the cooking water; drain the pasta and return it to the pot. While pasta is cooking, in a small skillet, over medium heat, combine 3 tablespoons oil, garlic, red pepper and ½ teaspoon salt. Heat and stir occasionally, until fragrant, 3-4 minutes. Remove from heat and set aside. In a large skillet, heat 1 tablespoon oil over medium heat. Add green beans and cook for 8-10 minutes. Add tomatoes, season with salt. Cook until green beans are to the texture you prefer. Add green bean-tomato mixture to pasta, stir in reserved pasta water and ricotta; toss to coat. Serve in pasta bowls with a drizzle of chile oil over top.